Microbrewed, Fair Trade Certified, organic tea leaves blended with freshly-milled organic spices & organic ingredients. 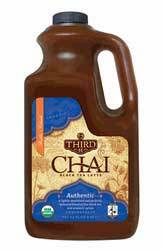 This is the freshest, fullest flavored, most delicious chai tea concentrate available! Authentic Chai: A lightly sweetened & perfectly balanced blend of fine black tea and aromatic spices. Honey Vanilla Chai: A richly smooth blend of fine black tea, aromatic spices, wildflower honey, and pure vanilla extract. Spicy Ginger Chai: A generously spiced blend of fine black tea, fiery ginger, and freshly-milled aromatic spices. Green Tea Chai: A delicate blend of healthful green tea and rooibos, with a gentle hint of almond. Sugar-Free Chai: An exotic and balanced blend of black and herbal teas and spices, lightly sweetened with stevia. Decaffeinated Chai: A relaxing blend of soothing, anti-oxidant rich rooibos tea, decaffeinated black tea, and aromatic spices. Note: Third Street Chai's facility is wind-powered! 100% of the ingredients used in the production of this tea were composted for local organic farms in Boulder County.